Tech giant Nintendo has unveiled a reboot of the Streetfighter franchise which will see the classic game take to the streets of Belfast. The update hopes to cash in on the burgeoning market for viral videos of drunk folk fighting bouncers outside Belfast clubs, says Nintendo’s chief game designer Yu Jo Kin. 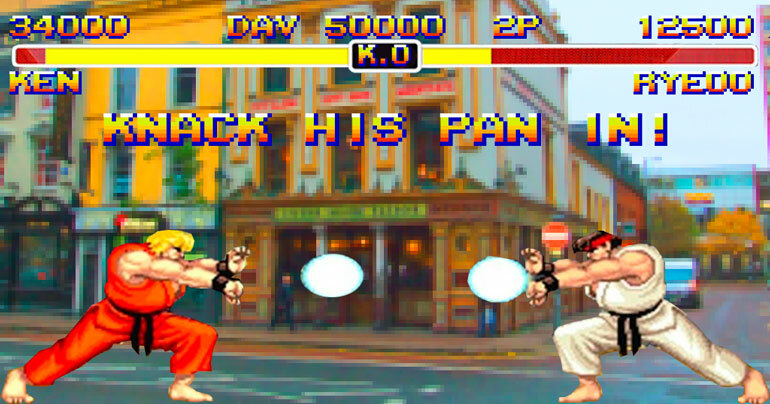 Fans of the original will be delighted to see the return of characters such as Ryu and Ken Masters, who’ve been given the new Belfast names of Ryeoo and Ken Plastered, with Ken’s signature move – the Hadoken – replaced with the Huboken. Local politicians were quick to condemn the game, saying that it could incite violence. “That’s our job,” explained one disgruntled MLA. Great Victoria Streetfighter will be in all good off licences from this Friday priced at £49.99, with a special collectors edition that comes wrapped in a blue bag with a miniature of Buckfast available at £69.99.